Robert Weil Figures In The Sand. Mixed media, including what appears to be sand, on illustration board. Mixed media on illustration board. The illustration board appears to have been painted over with a pink colored paint (see extreme upper-left corner), which was then covered over with a painted/scratched media of a thick, cement-like grainy surface, which may flake-off if the illustration board is bent. In order to stabilize the piece, it was mounted on top of acid free matte board and supported further with an acid-free backboard, and framed with UV-protectant glass. The unframed size of the piece is 23 3/4" x 17", framed size is 29" x 21". 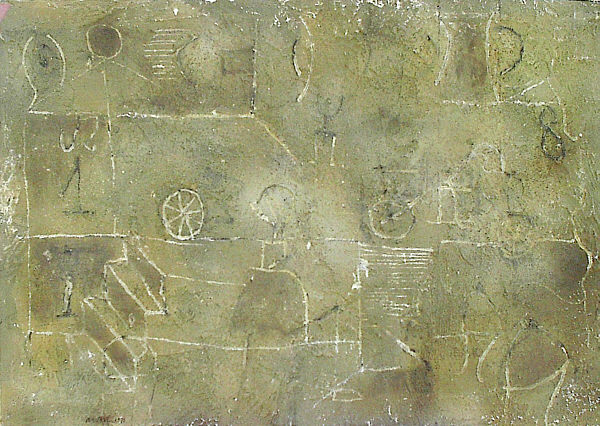 Figures In The Sand, 1970, original mixed media painting on illustration board, signed by Robert Weil.